Have you ever had one of those days where you wished you were somewhere else, doing something wonderfully exciting instead of sitting at your desk? Today was one of those days for me. 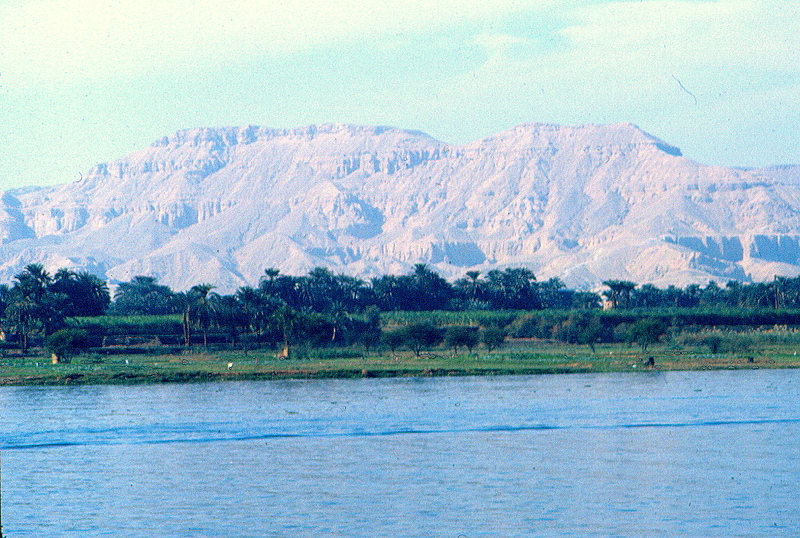 I found myself dreaming of being back in Egypt, on a slow boat chugging up the Nile River. I’m not sure what made that pop into my head today, but I tend to wax nostalgic about trips I’ve been on during the months that they took place, and in November 1989 I was in Egypt. That trip was the first big adventure that my hubby Mike and I undertook, and it was quite a journey. Our tour company, Transglobal, gave us a lot of information ahead of time about what conditions would be like, how to pack, etc., but we still had no idea what to expect about actually being there. Cairo was chaotic, noisy and fun. To see King Tutankhamen’s famous gold mask in the Egyptian Museum was like a dream. We spent a day out on the Giza Plateau — touring the very first pyramid at Sakkara, gazing at the enigmatic face of the Sphinx, frog-walking up the Grand Gallery inside the Great Pyramid and wondering what all those strange passageways were designed for – and then visited a papyrus-making enterprise, where Mike and I bought one painted with the statue of Anubis just like the one we’d seen in the museum. We rented striped cloth shoe-covers to explore the magnificent mosque at the Citadel, overlooking the jumbled rooftops of Cairo, and had lunch in a dim restaurant where the smoke from huge frying pans of falafel patties wafted upwards to form clouds on the ceiling. We had a day to wander around by ourselves, so Ron from Holland joined us to explore the crazy, exotic Khan-el-Khalili Bazaar, up and down the dusty stone-floored passages filled with spices, coloured skeins of wool, perfume, leather goods… Mike and I bargained over bottles of pop (sharing a beverage with the owner was an essential part of bargaining in Cairo) for a brass hookah in a murky shop at the end of a lane – then had to try to find our way back out of the maze of streets again. But it wasn’t until we stepped onto our small boat on the Nile that we felt we were slipping the bonds of time and voyaging through history. We watched scenery that seemed unchanged from thousands of years ago pass by along the river – boys leading donkeys laden with bundles of reeds along the sandy banks, men casting fishing nets from shallow canoes, thin stretches of palm trees beyond which the endless rolling dunes of the Sahara stretched away toward the horizon. After lazy hours of chugging up the river, we’d pull over, tie up and visit an ancient temple, or a camel market. At night we’d enjoy dinner on the open top deck, wrapped up in blankets against the night chill, and attempt stick-dancing with our crew. One night we sat around a fire on the beach and sang songs under the stars with a local farmer. It was a truly magical experience. We did many more incredible things on that trip – seeing the hills of Valley of the Kings for the first time was breathtaking, and we watched the rising sun gild the massive statues of Ramses II that guard the entrance to the temple at Abu Simbel. We rode a camel out to a long-abandoned monastery in the desert at Aswan and held on for dear life, laughing hysterically, when our mount decided to charge back down the sand dunes to the waterfront. 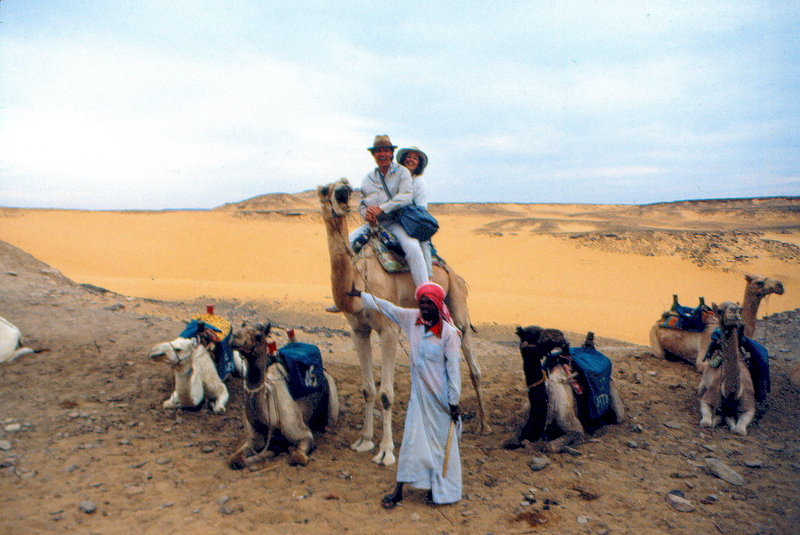 Going to Egypt was our first taste of real adventure, and we’ve been hooked ever since. On days when I’m stuck doing paperwork, I remember that amazing journey and travel back there in my mind for a little while.